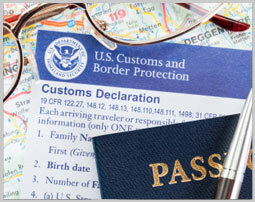 U.S. Customs is the shorthand for U.S. Customs and Border Patrol, commonly referred to as CBP. CBP is a federal law enforcement agency of the U.S. Department of Homeland Security. Their main agenda is to guard the borders, facilitate international trade, collect import duties and enforce immigration, trade and customs laws. Largest Law Enforcement Agency in the U.S.
CBP is the largest law enforcement agency in the U.S., employing more than 45,600 sworn federal agents and officers and over 60,000 in the entire operation. They are responsible for guarding nearly 6,000 miles of land bordering Canada and Mexico. They control 2,000 miles of coastal waters surrounding the Florida Peninsula and the island of Puerto Rico. They guard 95,000 miles of maritime border alongside U.S. Coast Guard. CBP officers regulate official ports of entry to the U.S. These officers are considered to work at the front lines of the organization's anti-terrorism mission. Officers are hired on the basis of a keen sense of judgment and a cool wit. Not only are they responsible for checking the validity of your passport, but assessing the risk travelers or cargo may pose. They may physically check all persons, cargo and vehicles entering the U.S. They have the ability to hold travelers for questioning or to seek more information on them. They may also refuse travelers and cargo entry into the U.S.
CBP Border Patrol agents prevent illegal entry into the U.S. of both persons and cargo. They monitor the borders by land, sea and air. Border Patrol Agents work around the year and around the clock in inclement weather of harsh winters, choppy seas or hot desert sun. The Border Patrol was established in 1924, employing only a few dozen. Today, Border Patrol employs more than 20,000. They maintain safety of the borders through many techniques. Linewatch. The practice of physically watching border lines. Signcutting. Watching for disturbances in terrain around borders and investigating their source. Traffic Checkpoints. Stopping and sometimes searching vehicles on highways near borders. Marine Patrol. Over 100 vessels patrol the coastal waterways of the U.S. and Puerto Rico and the interior waterways between the U.S. and Canada. Horse and Bike Patrol. Agents on horseback and bicycle patrol land borders that are inaccessible to all-terrain vehicles. Integrated Surveillance Intelligence System. Remotely monitored 24 hour camera and sensing systems that respond to illegal crossings. Unmanned Aerial Systems. Remotely piloted aircraft that provides unmanned surveillance of remote land borders. Geographic Information System. Used to track illegal migration patterns at the southwest border. As the largest law enforcement agency in the U.S., the numbers of CBP's results are astonishingly large. Below are figures from the 2012 fiscal year from CBP. 174,000 potentially dangerous pests prevented from entering the U.S.